As one half of a Turkish-American marriage, I am always interested in other people’s experiences in the living of a cross-cultural life. And as you may have gathered, I have a troupe of traditional yet modern Karagöz shadow puppets who have assigned themselves to me in order to help me navigate my Turkish-American life. That is what this blog is all about – a little bit reality and a little bit fantasy. While I take the sci-fi meets anthropologist approach to documenting my experiences in between cultures, another blogger takes a more straightforward approach. One of my favorite blogs on cross-cultural married life is written by Trisha Thomas, the author of Mozzarella Mamma: Deadlines, Diapers and the Dolce Vita. Trisha dishes on all things mamma, all things wife and all things journalist as she balances the care of her three kids – with panache and wit. 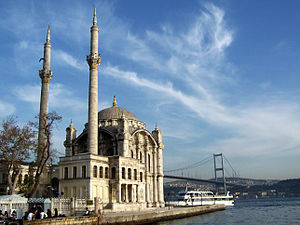 However, at the moment, she is enjoying Istanbul, which you can read about by clicking here. Looks like she has ascertained that female Istanbullus are giving Romans a run for their money on the wearing of high heels and that there are more than one pimples on the face of Turkey’s current strong economic and political reality…I’ll leave the rest to her. Enjoy Istanbul, Trisha and Gustavo! This entry was posted in Cross-cultural learning moments, On writing about my life with the Karagöz puppets and tagged cross-cultural, cross-cultural marriage, istanbul, Turkish American. Bookmark the permalink. Thank you for your wonderful endorsement. I hope my thoughts and impressions of Turkey have not left you and M scratching your heads at my ignorance! It is always interesting how others navigate being a cross-cultural couple. Hey N, I’ve been tracking your Istanbul joenury on Instagram and was thrilled-I’m going next month! Do you have an email address where I could pick your brain a bit on the best everything (sugary treats and other carbs)?